I wrote this poem for my friend Chrissy and her little angel Lala. Softly the babe with in her arms giggles by the light of the moon. 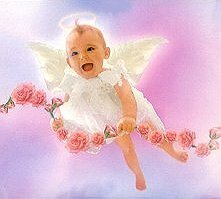 For the Angel's here with Lala...your precious little gift. She softly moves to the bed, Her mother she sees sleeping. Mommy how I love you and we will meet again one day. I am here to wipe away your tears, To give you strength from up above. So you can go on living and rejoicing in the memory of what was. I am still here with you always and in your heart I'll always be. Jesus is taking such good care of me. She's made a special trip just to wipe away those tears. To let you know she loves you and to erase your fears. To remind you to be happy and that God loves you so. So tonight while you lie sleeping, give a little smile, say a little prayer and know your angel Lala is with you right there." 07/02/02 written by Melanie for Chrissy. In Loving Memory of Lala.